Full Tilt is a duel minigame in Mario Party 6. The name comes from the term "full tilt", which is an idiomatic phrase for going quickly. The camera focuses on the goal. It then moves to the player showing the entire course. The screen splits into two to show the second player. The objective of the game is to be the first to get to the other side of a wide hole by carefully walking across a tilting bridge. Players must be careful not to fall, or they will lose valuable time as a Lakitu retrieves them. There are a few shortcuts that players can utilitze to reach the end faster. 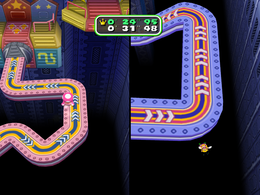 The middle of the bridge acts as a checkpoint; if a player falls off afterward, the Lakitu will carry them back to this point. Rules – "Race along the tilting, twisted path and reach the goal first to win!" Advice – "If you fall off the path, you will return to the last checkpoint you crossed." This page was last edited on March 30, 2019, at 02:03.